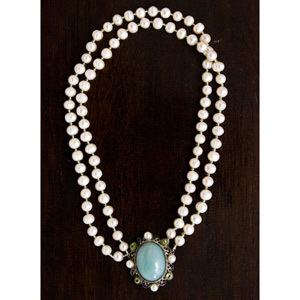 Talented jeweler Cha-Aim crafts this extraordinary necklace by hand. She threads a double strand with iridescent pearls. The pearls are spaced with little peridot spacers. 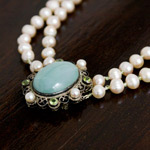 The jadeite jade pendant is set in sterling silver with facetted peridot and round pearls set on the sides. The pendant can be detached and used as a brooch. Materials: Freshwater pearl, peridot, jadeite jade, sterling silver.